Tuesday January 14th 1896 I was busy about the house all morning. Will took down a coop of chickens in the forenoon. After early dinner we went over the river. Fanny went to Des Moines this morning. Had good visit, came home to do evening work, put in time on the mat in evening. Wednesday January 15th 1896 I got my things ready to take down to the church and Will went me for his dinner. Hattie was there After the dinner I called on Mrs Jake Horn and and at Mrs. Borlines. It was late when we got home. Thursday January 15th 1896 I did some baking this morning and swept up the house a little I had company in the afternoon Mrs Luse and Mrs Mackey were out. I worked on my mat in the evening. Friday January 17th 1896 Will and I took an early start over to Woolfs. Had a pleasant visit and Mary came back to Missionary meeting with me at Mrs Dr Hogards. We had a delightful session. We had only got the supper over when Mr Scales came with another gentleman who talked life insurance all the evening. A lovely day. 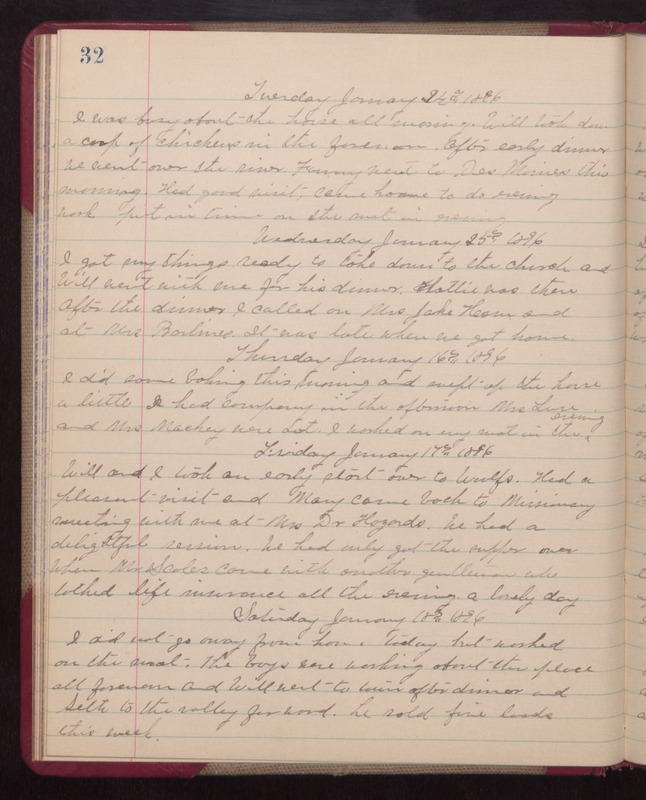 Saturday January 18th 1896 I did not go away from home today but worked on the mat. The boys were working about the place all forenoon and Will went to town for dinner and Seth to the valley for wood. he sold five loads this week.